I read this article and found it very interesting, thought it might be something for you. The article is called Protest and Pride: Goings-on in Seattle, Tacoma, and Yakima and is located at https://votesocialism.com/protest-and-pride-goings-on-in-seattle-tacoma-and-yakima/. 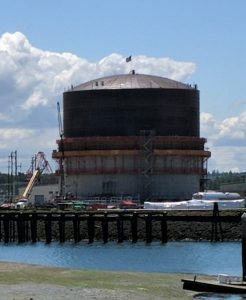 “I’d like to congratulate the Puyallup Tribe for its victory in forcing further environmental review on the LNG bomb over there.” So Steve began his statement opposing Puget Sound Energy’s liquefied natural gas (LNG) terminal which is being built, unpermitted, on tribal land in Tacoma. This was a week of protests with some fundraising thrown in for good measure. Like many in Seattle, we were astonished to see the breaking news that Seattle City Council was going to repeal the progressive “head tax” on big businesses to fund homeless services and affordable housing. The Hoffman campaign joined hundreds in council chambers Tuesday, with the majority clearly stating their horror that the council was considering repealing the tax less than a month after they unanimously voted for it. “The council needs more backbone and should not cave in to blackmail by corporations and people who have more money than they know what to do with.” Listen to Steve’s testimony here. The majority on that legislative body showed they did indeed have no vertebrae and bowed to the corporate winds. The head tax was repealed. Thursday’s gathering at the Slow Boat Tavern was just what the doctor ordered! Folks relaxed with brews, African meat pies and good conversation. All while raising what turned out to be a not-so-small amount of funds for the Hoffman campaign. Many thanks to Ken, the proprietor of Slow Boat for his generosity and help. And for having some of the best beer in Seattle. 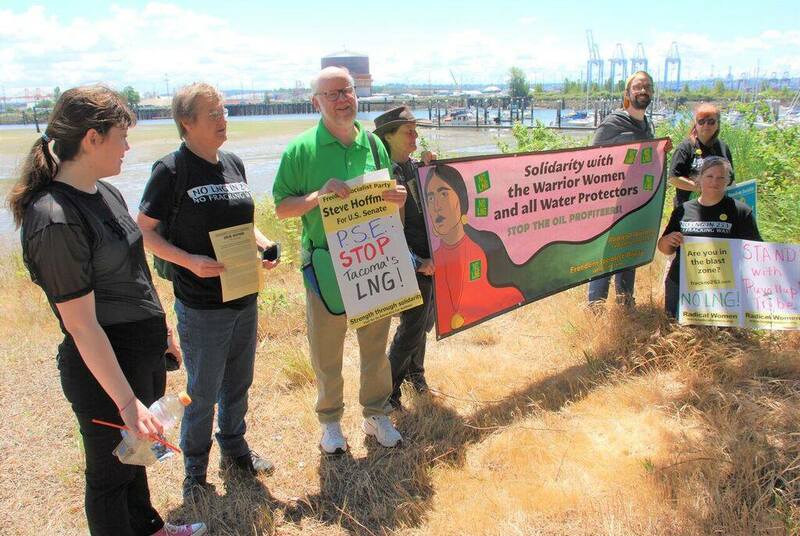 Friday, Steve and volunteers met up in Tacoma to speak out against the proposed LNG storage facility mentioned above. Seattle Radical Women sent a representative and we met new friends from Tacoma and 350Tacoma.org. The terminal is visible in the background, a huge behemoth. Part of the anti-LNG facility campaign is to educate residents about the facility’s explosive dangers. “Are you in the blast zone?” their signs ask. To find out more, go to www.frackno253.com/ and redefinetacoma.org. Videos will be uploaded soon. Steve also spoke to members of IBEW Local 77 Unit 149. As tree trimmers, they perform some of the most dangerous work in the union, shaving trim limbs around high voltage electrical lines. The room appreciated hearing from Steve and we made some new friends. 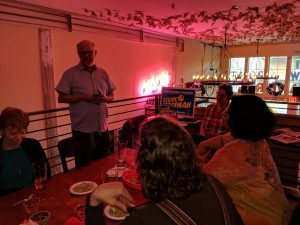 Thursday will find Steve in Yakima where he will present to WFSE Local 1326 and spend some time campaigning around the city. Trips to Bellingham and back to Spokane are in the works as well. Seattle Trans March is on Friday night. Meet at Seattle Central College Plaza at 5pm. Table at Seattle Central College Plaza Saturday during Pride Fest Capitol Hill and campaign along Broadway, starting at noon. Seattle Dyke March and Rally starts at 5pm Saturday evening, also at the Seattle Central College Plaza. Sunday, campaign among attendees of the Seattle Pride Parade before it starts. Hand out postcards and literature to folks waiting on the sidewalk. The Parade begins at 11am at 4th and Union in downtown Seattle. Do come down to campaign headquarters on Wednesday for Volunteer Night. Share your ideas of where to go and how we can continue to build the movement for class independence from the bosses’ parties! The more money that comes in, the more militant ideas can go out! Our low-budget, gumption-filled campaign needs your help to spread the news and ideas of Steve’s campaign. Or write a check payable to Advocates for Hoffman and mail it to 5018 Rainier Ave. S., Seattle, WA 98118. Thank you to all for all you do!